When exposed to a threshold concentration of glucose, pancreatic beta-cells from a wide range of species exhibit a complicated pattern of electrical activity. Bursts of action potential spikes (the "active" phase) are observed, separated by a "silent" phase of membrane repolarisation. At even higher glucose concentrations, continuous action potentials are seen. This electrical activity has two important physiological correlates: increased cytosolic Ca2+ concentration ([Ca2+]i) and increased rate of insulin secretion during the active phase. It is generally accepted that the rise in [Ca2+]i plays a major role in insulin secretion and that the action potential spikes during a burst are responsible for the rise in [Ca2+]i. Because the glucose signal for insulin secretion operates via metabolism rather than through a plasma membrane-bound receptor, the details of how glucose stimulates electrical activity have been difficult to resolve. However, experimental data and theoretical models have begun to investigate the phenomenon. In 1997 Gerhard Magnus and Joel Keizer published a minimal mathematical model to describe Ca2+ handling by mitochondria in the pancreatic beta-cell (see The Magnus-Keizer Mitochondrial Ca2+ Handling Model, 1997). Their kinetic model incorporated six transport mechanisms in the inner mitochondrial membrane, including proton pumping via respiration and proton pumping by the F0F1-ATPase, a proton leak, adenine nucleotide exchange, the Ca2+ uniporter and Na+/Ca2+ exchange. In their 1998 model, Gerhard Magnus and Joel Keizer continue their development of a kinetic model of bursting electrical activity in the pancreatic beta-cell. Their minimal model of Ca2+ handling is expanded to include, amongst other factors, the glucose dependence of the rate of production of mitochondrial reducing equivalents (see the figure below). A schematic representation of the bursting mechanism assumed by the Magnus-Keizer whole cell model. This diagram shows the plasma membrane currents associated with burst and spike oscillations; the area corresponding to the cytosol gives a simplified description of Ca2+ feedback driving adenine nucleotide concentration oscillations and ATP-sensitive K+ (KATP) channel gating. Uptake of Ca2+ by mitochondria positively affects oxidative phosphorylation by activating pyruvate dehydrogenase (PDH) and other dehydrogenases; futile cycling of Ca2+ across the mitochondrial inner membrane periodically diminishes ATP production by lower the inner membrane voltage (delta_psi). 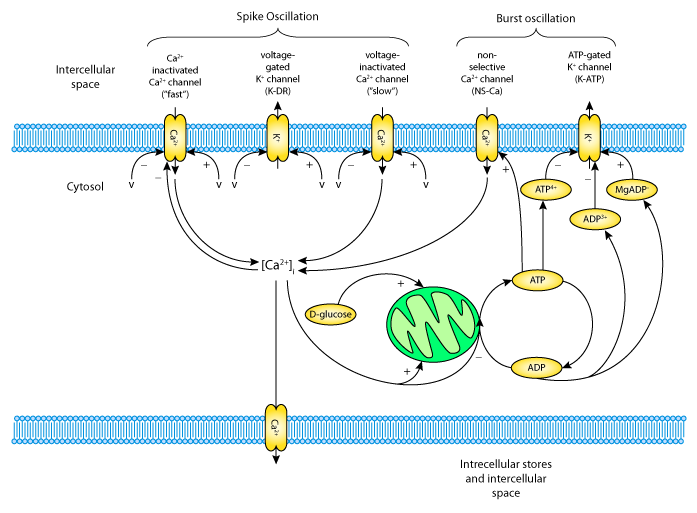 The black arrows represent ion fluxes and the red and green arrows represent inactivation and activation (respectively) of membrane transport and other key processes. Derived from workspace Magnus, Keizer, 1998 at changeset cd5074048cc9.